I've been searching for a pair of bedside tables or cabinets but to no avail, I've found nothing. 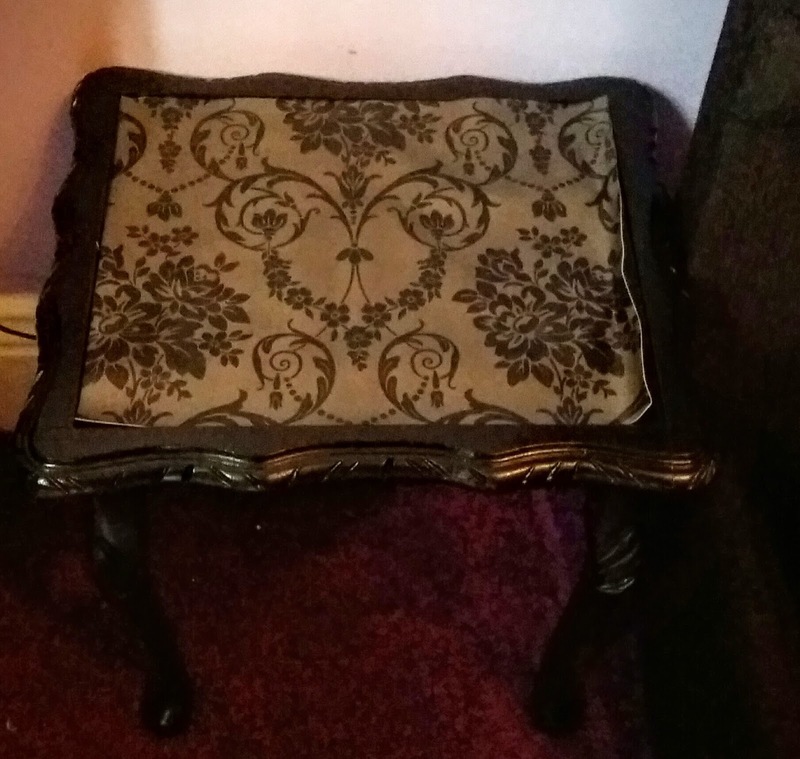 It hasn't helped with my exact specifications of sort of french style, small, Queen Anne legs and something complimentary to my dressing table. As usual, living my jet set lifestyle, I fancied going for a glamours shopping spree to Byker, so basically a thrifting raid. I find Byker's great for charity shop finds and certainly the last few times, I've got some killer finds for pennies, well not pennies more for a few quid. My favourite charity shops are St. Oswald's Hospice. I'm more than happy to donate my money here; its a local charity, sells great stuff, always decently priced and plus, I always get fantastic finds. I walked passed one of their furniture stores and spotted a small table sitting outside, I literally grabbed the table like some a crazy person, dashed in, searching for a volunteer, ready to pay immediately, waving my debit card. Questioning in a whooping manner asking, " Can I pay with this ?" The manger came over, I thought he was ready to ask me to leave. My fears were unfounded.The manger told me about the other matching table in the shop with it glass top intact and he offered me the pair for £8. Originally, I only wanted the one but with hindsight, I'm pleased purchasing the the pair. 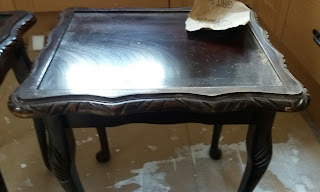 I lightly sanded the table to remove the top layer of varnish, using a coarser sand paper, I'm not sure the type I used. After sanding, I wiped all the tables down with wet wipe before priming. 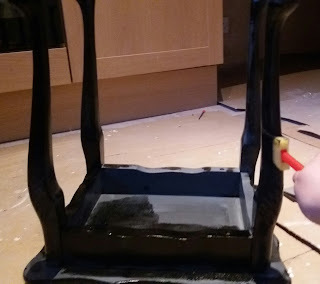 For priming, I used Wilko's Furniture Primer, which usually comes in white. After first using it on my dressing table, the white primer doesn't work well with dark paint. 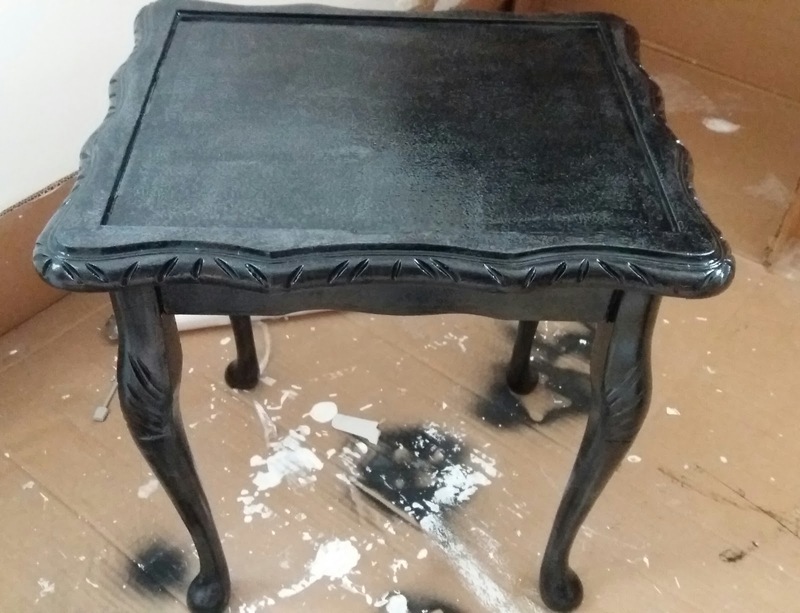 I later added black acrylic paint to the primer turning into fifty shade of grey it looked much better than white. I applied. After one coat of primer. 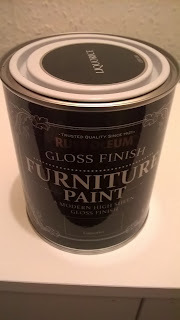 I used the left over from the Rustoleum Gloss furniture Paint in Liquorice (simply black gloss.). This is what the table looked like after the first coat, I applied the first coat with roller. I to dry over night. I lightly applied a second coat this time using a form on stick brush. On my first table,I painted, I made the mistake of painting the top first. After the first coat dried, I painted the underside. After a third coat. I painted a light third coat, I might do a a forth coat, as I've noticed a few bits look slighty patchy. 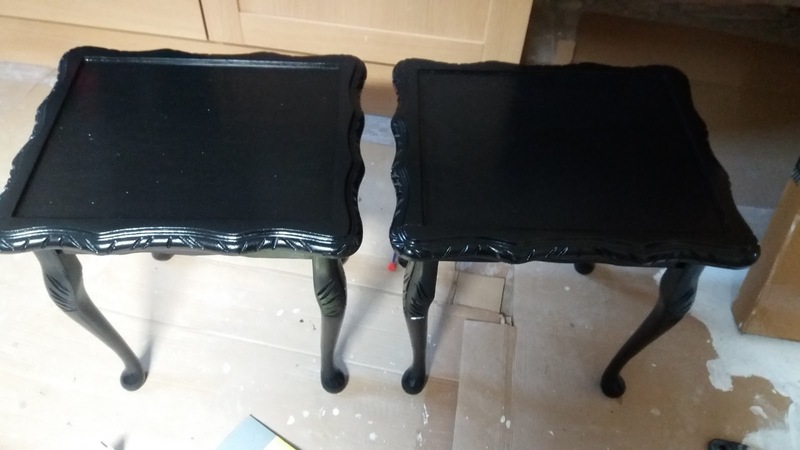 After experiencing black gloss paint is a nightmare for getting marks, so to protect the tops add some interest. I placed some vinyl, I've had. 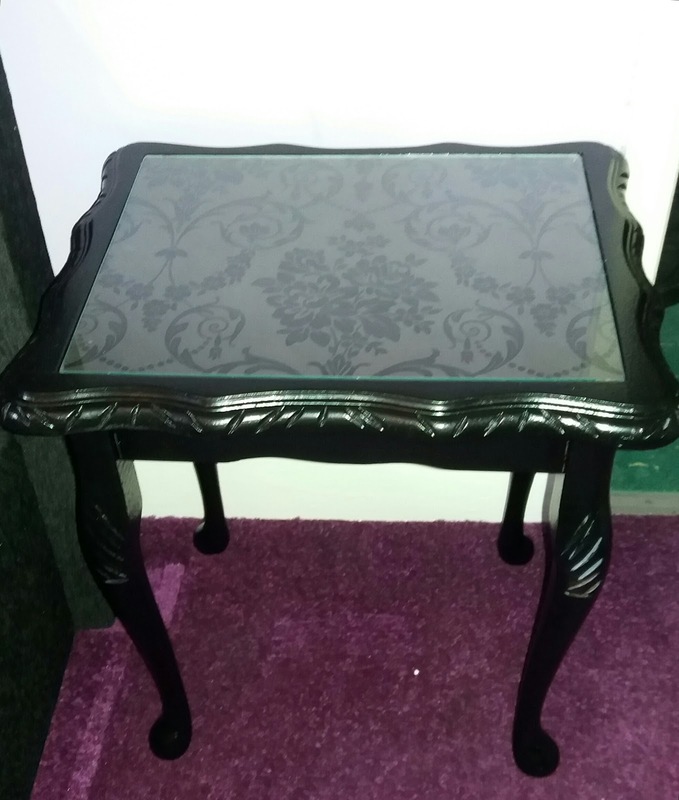 I traced the glass top, cut out the pieces and placed onto the tables. Unfortunately, in places the paint is bumpy and uneven, still once in my bedroom it'll be hard to see the imperfections. In time, I plan to find a piece of glass for the other table. Either way, I'm happy about the tables and love them. 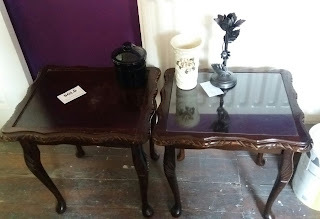 I have two new beside tables for £8, woo. I love their new look, it looks superfancy! 8 pounds is so cheap for such lovely bedside tables. Wow - fun find. They look great after the makeover. Thanks, I'm so happy about them. Thanks, wow, I'm quite surprised you don't you don't have thrift shops or any second hand shops.I like Ikea for certain things and few years the had some nice furniture in stock but their recent ranges are horrible.I really feel for you. I love these and I always like your remakes on Instagram - they're the best! Thanks that really sweet. I lover instagram it's so quick and easy to do. I've got a couple of more things to do I probably won't be doing any more for a while. Greetings from the other side of the country! But as we're at the narrow end, I'm not so very far away in Carlisle. Thank you for your blog. I've only just found it. I stopped reading all the blogs I used to follow when I had too much life stuff going on so finding yours now when you've been at it for a while is great - plenty to read in the archives. And it's very nice that you're semi-local so that I actually know some of the places you talk about like Hexham where girlfriend Lol and I sometimes go for a day out. Good fish and chips in Hexham. Girlfriend Lol has a Victorian terrace too (she lives in the city and I live a few miles out in a little village). Over the years she has done extensive repairs and decoration and was recently talking vaguely about repainting a dresser (not an antique one) so I showed her your blog and said "Doesn't it make you want to paint something?" in case it would help to get her started! The bedside tables look really good. If you were prepared for them not be a matching pair, you could tile the top of the one missing its glass instead of getting a bit to replace it. But if it was me I'd probably just get Carlisle Glass to cut me a sheet to size, maybe toughened glass rather than window glass (if not too expensive) as I'd be bound to drop something and smash it! Hello, to Carlise, it always lovely to hear from people from the North, no matter which side of the Pennies they belong. I'm on a bit of mission to try and meet Northern bloggers and vloggers or anyone from the North, lol. I love Hexham, as you can't tell, lol. I don't get up their too often it's nice to get away from Newcastle every so often. The bus stops at the top of my street, good excuse for more adventures in Northumberland. I love the Hexham charity shops and Abbey. Thanks, for the recommendation about the chippy, I hate fish and chips. Thanks for saying it made you feel inspired, to paint something. I can't take all the credit, I've been really inspired by Bane from Goth It Yourself, it pretty my inspiration for a lot of my ideas. I highly recommend her blog. I met Cheryl at one her painting workshops, as part series of creative community craft works shops. and she was handy for ideas and advice on painting. Also, it appeals to my love of interior design.https://allroundcreativejunkie.com . I'm not obsessed about having everything matching. However, I love things to be coordination and complementary. For the table I want them to match each other. 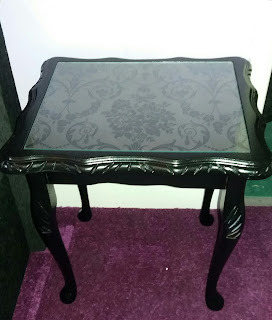 I was going to look for a local glass cutter or buy cheap picture frame according to the size of the table and replace it. Thanks for the advice that's really handy. It always nice to hear from people, who enjoy reading my blog. Wow, well done!!! Thank you for sharing all the steps you used to create these beauties!! Really love what you did!!! Thanks, I'm happy you find the instructions helpful, it's good to know its worth still doing. 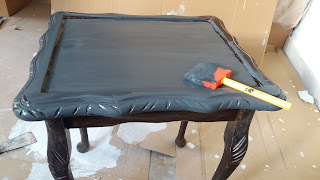 I hate reading blogs where they have Diy post there is no instructions or videos to show how to replicate their idea. Thanks I'm glad it played some inspiration. I've tried to redecorated my bedroom on a budget where possible but the rest is brand new. I love seeing how people decorate their home and love when it's done on a budget. My biggest inspiration is Goth It Yourself. 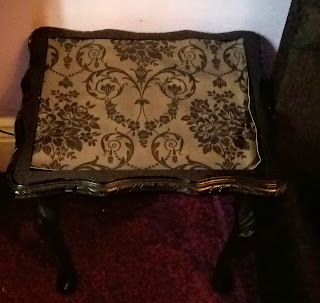 I love anything to do home decor on a budget.I loved your recent dresser find it was loevly. I'm looking forward to your finished Pirate style sitting room. Thanks. I absolutely love them and for £8 pound, I'm garb smacked. I've meant to research for some local glass cutters in my area but it hasn't been high on my proprietors. If the worse get to the worse I can always get a cheap picture frame and cut to size. 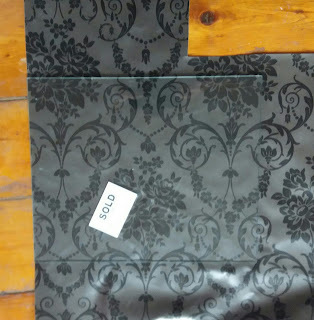 The vinyl I used was from the Range, which sold it by the metre, so I stocked up and have plenty to spare. Well done :D They really turned out well. Thanks you. I'm really happy with them.